Gervic is one of the Spitz barges (39 metres long with a 5 metre beam) and was built in Doornik, Belgium in 1950.During its working life it was a commercial transport working on the waterways of Belgium and northern and central France. In 1994 "Gervic" ended its working life and was laid up to be forgotten in Gent, Belgium. 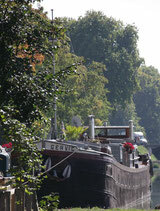 We bought "Gervic" in 2002 and, as a longterm project, developed her into our home up until 2011. Gervic is divided into three parts; at the centre of the boat is a large open plan lounge which, by prior arrangement, can be available for breakfasts and dining. 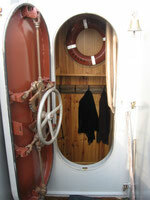 Aft are our private living quarters and forward the guest accommodation. The guest accommodation has two bedrooms, one with two single beds whitch can be joined together, and a third single bed. Bedroom number two has a double bed. An additional bed can be created. Within the quest accommodation suite there is a lounge/dining area, kitchen and bathroom with washbasin and shower. All rooms are centrally heated. An outside area is available to guests and a BBQ is available.